Seen at a glance, the new power amplifier from nOhr looks rather minimalist, with only the on/off switch and nothing more. One could even think of it as a monoblock, due to its dimensions and shape, expecting to find an essential rear panel - just a pair of binding posts and the plug for the power cord. Aesthetically, there's not much to say - a long and narrow box, regularly shaped, with a consistently thick brushed aluminum front side. The chassis is made up of black painted tin. The fascia is enriched by a simple power switch with a green LED to display its operative status, while the rear panel is much richer with controls. Again, on the rear side you can find a pair of metal handles, useful either for placing the amp or for keeping the right distance from the rear wall, protecting the several controls. It has a rather sober general frame without any particularly interesting aesthetic idea. 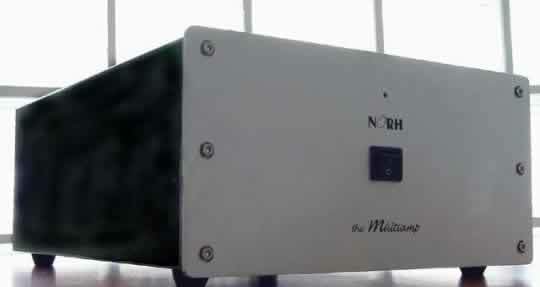 Rear view of nOrh Multiamp: dig with all those commands! Active - this is really the more interesting mode, allowing you to eliminate the two-way loudspeaker inner x-over, substituting it with the 24 db / octave active filter inside the amplifier itself. This way you can select the cross frequency (between 2000-2500-3000Hz), and optimize tweeter level among a range of 11dB. All the connection operations are simplified by the lighting of specific LEDs indicating where to plug the cables according to the different operative modes. 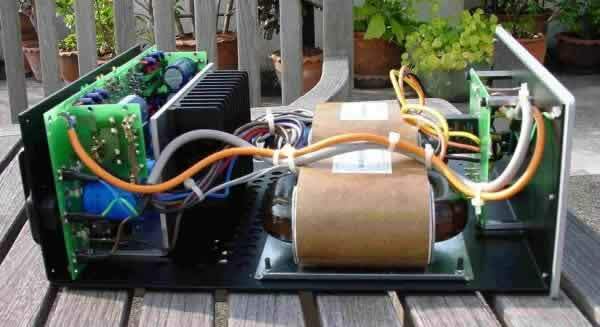 This is a dual mono device, with a power supply sporting a pair of 350 V/A transformers with several limited-value filter capacitors, a scheme preferred to ensure good speed of the system. The power section relies upon Thomson-produced devices (CSF 7294), developing a peak current of about 10 Amperes per channel, with particular attention to the signal path. Its dimensions are 282x150x420mm, W x H x D.
Ah, I was forgetting: do you want more power, doesn't your source feature variable output, or do you already own a delightful and good-sounding amplifier you don't want to give up, but whose watts can be counted on one of your hand's fingers? No problem, the Multiamp adapts to this case, too, offering high level inputs accepting the signal from the speaker output of your amplifier! It's clear how this flexibility translates itself into the ability to progressively perform significant upgrades, with no need to change your current amplification. First, let me say that the following listening impressions are referred only to the stereo mode, with a single amplfier driving one pair of loudspeakers, each with its own passive crossover (the basic configuration, that is). The first impression is to deal with a rather real, solid, and almost rocklike approach to the music. Frequency extension seems substantially complete, although sometimes the lowest frequencies, below 50-60Hz, are a little behind the immediately higher ones, yet lows are energetic and with good punch. Mid-lows are controlled enough and well joined with the rather warm and fluid mids. Upper frequencies feature a timbric performance a tad drier than the rest of that range; this, with a good but not exceptional grain finesse, suggest you be somewhat careful in choosing speaker cables in order to avoid dealing with little tonal coherence problems. The rythm sense is rather good, and the amplifier shows it possesses significant speed and energy, with pretty sharp attacks and decays, having my reference speakers work hard without ever loosing control over their drivers' membranes. Those charachteristics are evident either at low and high volume, but with a slight preference for the latter. Introspection and detail are satisfying, yet you can't say they are the strong points of this device, which prefers to accentuate macro- rather than micro- contrasts. So, we have good general dynamics, widely sufficient to render the impact required by the more violent and difficult music. But we also have a little less good micro contrast and ambiental nuances' rendering - little impulsive signals are less sharply depicted upon musical background. Yet, the background itself is a dense and firm carpet that gives a sense of thick realism. Maybe a not particularly refined performance but somewhat able to approximate the roughness and the concreteness that often the real event presents. You can find the same concrete sensation in the scenic reconstruction abilties of the Multiamp. Here, we aren't in the presence of an ethereal or "metaphysical" representation, with wide spaces and almost living elements, whose distance appears almost measurable. Instead, we have a performance full of a juicy physicity, with fixed and a little faded contoured elements. Obviously, we have virtual image width and depth, but those are concepts placed into a rather concentrated environment. The Multiamp provides a performance substantially agreeing with sonic characteristics already expressed that seem to prefer a concrete, very solid approach, and that rely neither upon a particular rendering, nor transparency, nor general air. Be careful with speaker cables: specify ones favouring low range articulation and transparency, and high and mid-high range sweetness and coherence. No other particular recommendation. I cannot say that this nOrh amplifier lacks originality. The aesthetic look is somewhat ordinary; not so the functional characteristics offered by the Multiamp, which, joined by a sound performance absolutely more than satisfying -and surely very good in terms of price ratio- constitute a notable added value. I think that the designers' sonic choices for this amp were made in order to achieve the top results, but without seeking after more sophisticated musical parameters that, due to project specs and budget, wouldn't have been possible to reach. Substantially: very good power, excellent operative flexibility, good sound. For 900 USD, what more can be asked? I really think the Multiamp has very few (if any) direct competitors. A heart-felt thank you to Michael Barnes, president of nOrh Loudspeaker Company, for having sent us their atypical Multiamp power amplifier for this test. 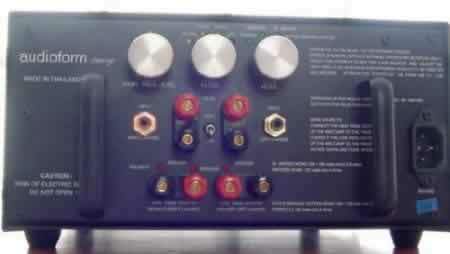 Thank you very much for your very postive comments regarding the Multiamp. The Multiamp was designed as a building block for someone to build a very high-end system whithout having to succumb to the dreaded audiophile disease called 'upgradeitis.' Upgradeitis is the affliction that causes people to constantly toss out what they have already purchased. nOrh wanted to create an upgrade path where a consumer simply added and not subtracted from their system. A customer can purchase a single Multiamp and upgrade to a fully active system with double the power simply by adding a second Multiamp. The customer not only doubles their power but also gains the benifit of having a fully biamped system with an active crossover. The customer can then add additional amplification and bass by adding our subwoofer. We believe that breaking down products into modular building blocks makes it much easier for someone to reach a very high level of performance than to upgrade one component at a time.